Jambalaya is such a great cool weather dish. It seems to warm you up from the inside out. When Valerie from California shared this crock pot jambalaya recipe I knew instantly that I had to share it with y’all. Add all ingredients except rice, sausage and shrimp to crock pot. Cover and cook on low for 8 hrs or on high for 4 hrs. Add sausage during last 30 minutes, add shrimp for last 15 minutes. Serve over rice. 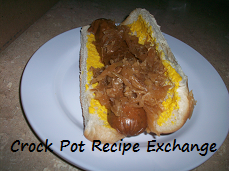 For a recipe like this, I would use a 3 – 4 quart crock pot. Since there is such an extended cooking time, I would consider using boneless skinless chicken thighs instead of breasts. The breasts (especially cut into such small pieces) could dry out easily. Any hot sauce should work. Just use your favorite, or what you have on hand (don’t go and special buy the Tabasco). Andouille sausage is best, but if you can’t find it, by all means, use smoked sausage or kielbasa.